When people hear of the medieval age their first thought usually is about castles, knights, suits of armor, jousting, and other knightly things. Many people often dream of living in such a time. But, little do these people know, many of the things I listed did not stick around for very long. The armor that many people think of when they talk about knights are those full suits of armor, completely decked out with every piece and facet imaginable, sometimes even etched with ornate pictures and engravings. While armor like this did exist, its high point in usage was not nearly as long lived as mail armor. In fact, for almost the whole medieval period, mail armor was used by almost all soldiers during actual battles. 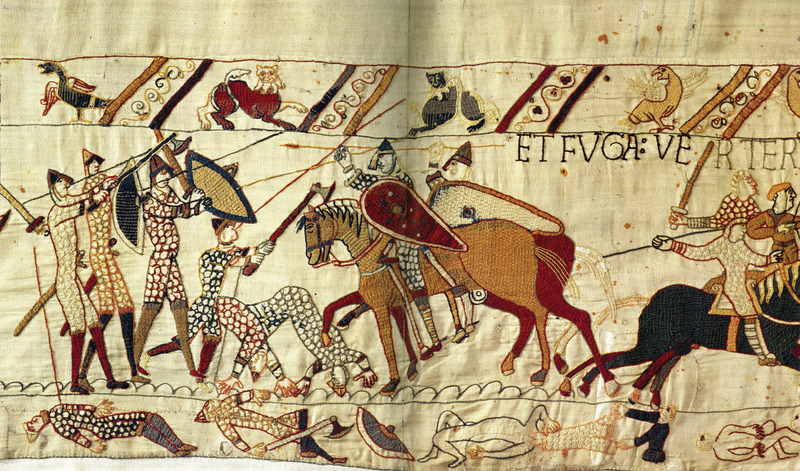 As one can see from the Bayeux Tapestry (c. 1070) mail armor was the main piece of armor used. This was in the heart of the medieval times and the tapestry showed in some great detail what exactly was being used at the time. Chain mail vests, open-faced helmets, large shields, spears, swords, axes, and horses were the predominant technologies of the time. Full plate armor did not exist until the late medieval age, and quite quickly turned from something to protect the body to more of a piece of art for rich or royal people or for tournament use. Rather than delve into the background of the evolution of armor (which I think most people know about) I wanted to cover what the actual suit of armor consisted of. Many people have probably not looked close enough into a suit of armor to realize all of the different pieces and hinges that made these things so useful. The type of armor that I will be describing will be steel plate armor from about the late 14th century to the 15th century. First of all, the knight would wear a helmet, which was either open or closed face. An open face helmet did not have a visor or any piece of armor covering the face. This type of helmet was more often found on armor made for royalty, probably to allow viewers to see who was wearing the armor. The closed face helmet had a visor of some sort with only a slit to see out of. This could have made the wearer’s field of vision smaller, but it provided exceptional protection for the face. The next piece of armor was the gorget, which was a piece that covered the neck area between the helmet and the breastplate. The pauldrons covered the shoulders, armpits, and some areas of the chest and back. For knights on horseback, one pauldron was usually cut away on one side to allow the resting of a lance. Next is the breastplate, which was one of the major pieces in the suit of armor. The breastplate covered the chest, torso, and back of the knight, and was made to be one of the strongest pieces of armor. Many breastplates had edges fashioned into them to make it able to withstand strong blows. The armor that covered the arm consisted of the couter and the vambrace. The couter was a piece that covered the elbow while the vambrace covered the areas between the elbow and the gauntlets or between the couter and the pauldron. These pieces advanced from being simple pieces of metal to being articulate joints, allowing a greater ease of motion for wielding weapons. Lastly for the upper body is the gauntlet, which covers the fingers and hands. Gauntlets eventually evolved into very sophisticated pieces of armor by having many hinges or plates to make the fingers have a full range of motion. 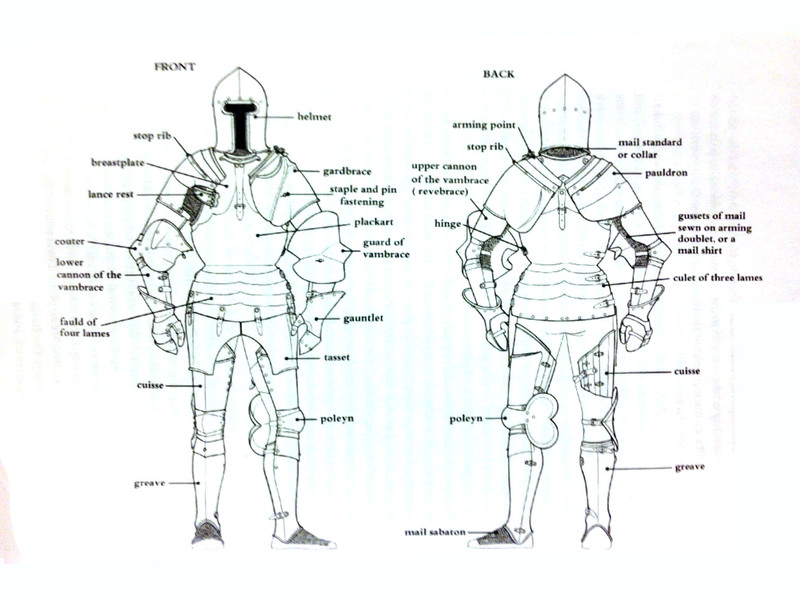 On the lower body, you have the fauld, which is made up of many pieces of plate armor that covers the waist. It covers the area that the breastplate cannot cover and protects the upper legs. The cuisse covers the upper thigh down to the knee. Connecting the cuisse to the lower leg guard is a piece called a poleyn. The poleyn is a joint that provides excellent protection while also giving great flexibility and motion. This piece, like the couter and gauntlets, had evolved from being just a piece of metal to being a complex joint. Next are the greaves. The greaves covered the shins and were built to be extremely tough. In comparison to other pieces of armor in the full suit, the greaves needed to be one of the strongest. A good blow to the shin or lower leg could render the entire leg useless, which would often times prove fatal. To compensate for this need for extra protection, the greaves were often fashioned with extra ridges to make them stronger, just like the extra ridges in the breastplate. Last, but not least, are the sabaton, which covers the feet. The sabaton were made out of many pieces of metal to allow for a more natural foot motion. All of these pieces make up a full suit of steel plate armor. While there are other pieces that I did not mention, these were the most vital components in the suit. But again, right as these great technological advancements were being made to the suit of armor, other deadly weapons were being created. New weaponry made the use of plate armor not as viable to use, which made it fade out rather quickly. People still liked the look of it though, because after the 15th century is when some of the most fantastically beautiful suits of armor were made, but these suits were made for show instead of for battle. To end my blog post, I will show a few examples of these late suits to show how intricate the details were. DeVries, Kelly and Robert Smith. Medieval Military Technology: Second Edition. Toronto: University of Toronto Press, 2012. Print. Pfaffenbichler, Matthias. Medieval Craftsmen: Armourers. Toronto: University of Toronto Press, 1992. Print. Wilson, David M. The Bayeux Tapestry: The Complete Tapestry in Color With Introduction, Description and Commentary. New York: Thames & Hudson, 2004. Print.